While the text of the Second Amendment is short, it still generates a great deal of controversy today. The roots of the Second Amendment can be found in the earliest of times in the history of America. The colonists recognized the need to have guns to protect themselves from various threats. In fact, one of the precipitating events of the American Revolutionary War was the attempt by the British to confiscate the arms and ammunition of the colonists being stored at Concord. The first battles of the Revolution at Concord and Lexington were the result of the attempt. After the Revolution, Americans still felt the need to have guns for self defense. At the time, there was a fear that the Federal government could become tyrannical and therefore the people needed to have protection. While that concern is no longer realistic, the debate about people having guns continued. The debate primarily centered around the question of whether the Second Amendment gives individuals the right to keep and bear arms or whether it only pertains to the States being able to maintain Militias such as the National Guard. Somewhat surprisingly, it was not until the 21st Century that the United States Supreme Court decided that issue. 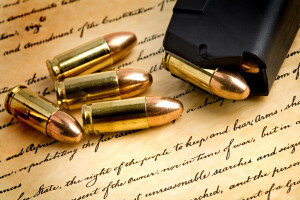 In District of Columbia v. Heller, 554 U.S. 570 (2008), the Court held that the Second Amendment protects an individual’s right to possess a firearm unconnected with service in a militia and to use that arm for traditionally lawful purposes, such as self defense within the home. Left unclear was the issue of whether the Second Amendment extended that protection to the States. The Court answered that question in the affirmative in McDonald v. Chicago, 561 U.S. 3025 (2010). The Court held that the Second Amendment was incorporated by the Due Process Clause of the Fourteenth Amendment and applies to the states. The Court also held that reasonable restrictions, such as prohibitions against convicted felons or the mentally ill owning firearms, could be upheld. Now that it is clear that Americans have the right to own guns, the debate now centers on such issues as gun registration, the types of weapons that maybe owned and how firearms may be bought or sold. Presumably the debate going forward will be to determine what kinds of restrictions will be upheld by the courts. In the wake of recent shooting tragedies in the United States, this has become a political issue as well. Some states have enacted strict gun control measures limiting the type of gun and ammunition that can be purchased or sold in that state. In all likelihood, these types of restrictions will be challenged in court as well. The debate is far from over.